Hyundai has turned green and awarded its first SEMA President’s Choice award to the JP Edition 2013 Hyundai Veloster Turbo built by tuner and designer John Pangilinan. John Pangilinan, know as “John P” in the tuner community, has been awarded the Hyundai SEMA President’s Choice award for the JP Edition 2013 Hyundai Veloster Turbo build that was unveiled at this years SEMA Show. “John P.,” is the first Hyundai SEMA tuner to receive the President’s Choice award for best Hyundai SEMA Concept. 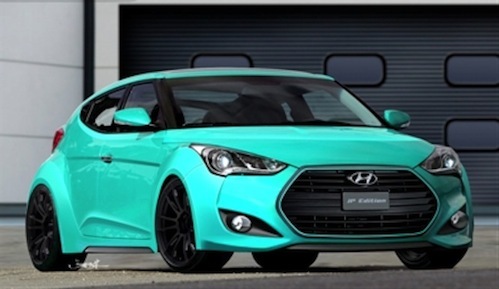 What you notice first on the Veloster Turbo, is the mint green exterior finish on the concept car. The California tuner worked with paint supplier BASF to come up with the brilliant mint green exterior finish that attracted much attention from attendees at the show. The BASF mint green exterior finish was applied by Auto Explosion in Gardena, CA. The JP Edition Veloster Turbo also gets a number of other exterior treatments like wide fender flares and a blacked-out wheel package. The TS Designs metal fender flares were designed by Jon Sibal. Underneath that brilliant mint green finish, the JP Edition is powered by a 1.6-liter, direct-injected Veloster Turbo engine that receives an ARK performance exhaust. The suspension gets enhanced by adding KW coilovers, Whiteline sway bars and anti-lift kit, and a Brembo big brake kit. The Veloster concept rides on blacked-out Ray’s Gram Lights 19-inch Xtreme57 Wheels and wrapped with Toyo Proxes T1 Sport tires to finish out the sporty theme. The interior gets special treatments like Recaro Cross Sportster CS Seats with Takata Harnesses, Re-upholstery by Infinite Auto Design, Alpine Electronics System built by BP Auto Sound and custom V-LEDs Lighting throughout the cabin. Based in downtown Long Beach, CA., John Pangilinan has been actively involved within the automotive industry for over 10 years. John P has worked with top companies and manufacturers like Scion and Ford. He has a number of successful concept projects he has built and has been featured in multiple media outlets, marketing materials, and auto shows. A few recent achievements include Scion Tuner Challenge winner in 2008 and 2nd place in 2010 and Ford design achievement award at SEMA 2011. He also just finished the Scosche x Alpinestars Subaru STI project car. The vehicle made its debut at SEMA within the Scosche booth and will be shown again in their Consumer Electronics Show booth in January. John P. will receive an honorary plaque for the award, as well as a $5,000 honorarium for his efforts with this JP Edition 2013 Hyundai Veloster Turbo concept. Look for more good things from the California tuner in the future. Anybody know? Will this Mint Green color Veloster be available to the public? If so, when and where? I want it really bad! It's very unlikely you will see this color as an option from Hyundai. It was a special feature just for this car. Thanks for reading! Awww man! Maybe I will get a custom paint job over a white car??!!! Too hillbilly? A little like "I might be a redneck if...." Can't help it, Jeff Foxworthy and I are from the same neck-o-the-woods. A custom paint job may be just what you need. And you will have a one-of-a-kind Veloster!